Hi everyone. A while back I purchased make up products from Dealz better known as Poundland over in the UK. Dealz/ Poundland is your cheap store where everything is €1.50/£1.00. I was kinda curious about the make up but at the same time didn't want to buy it because I didn't know what it would do to my skin. Even though I can wear almost anything and I will be ok, at the same time I am always cautions of cheap make up. One day I decided that I would put my fears aside and try this make up and see what happens because if you don't try you will never know. The next products that I will review for you today as just some of the products that I purchased. I got a few more which are still in the testing process. The first thing that I reached for was the foundation. don't ask me why because the foundation is always the last. The shade that I picked up is Ivory. Which I liked because as you know I always reach for that shade. 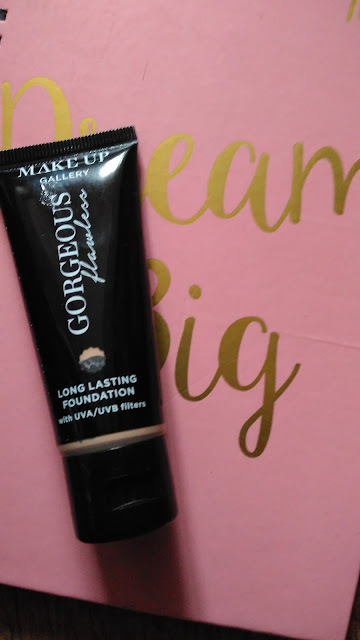 When I first tried in on I loved it because it matched my complexion to the 'T' so I thought. I did notice that it was a little grainy to the texture. Once it was blended in it looked very nice. A couple of hours later I noticed that it went very patchy and my dry spots very noticeable. Which didn't settle with me. I tried it with a primer, moisturiser and on a bare face and it everytime I got the same result. In saying that I will not be repurchasing the foundation again. The three eyeshadows that I picked up are as follows. I can't say enough good things about these shadows. All of these beautiful shades are supper pigmented they are supper easy to blend. I really can't say anything bad about these shadows. I love they so much and for the price you just can't go wrong. 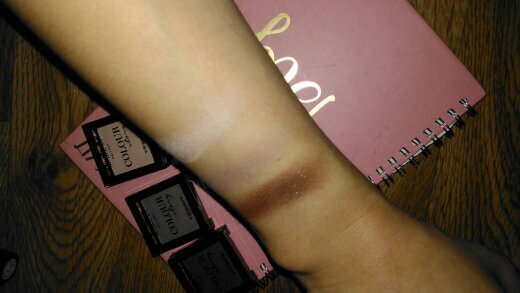 I know these swatches aren't the best as my hand is on the dark side over the summer. These shadows are the best for an everyday eye look. The last thing that I am going to talk about it the lip glosses and lip sticks. I have good news and bad, so I think I am going to start with the bad and that is the lip glosses. I purchased two and I only could find one on the day I was swatching for this post. 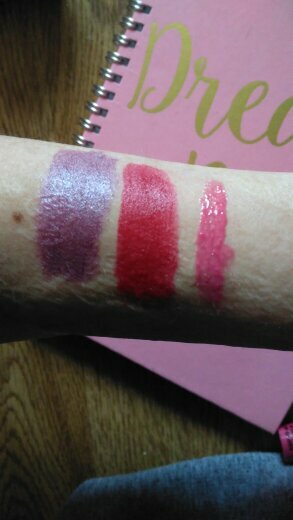 These lip glosses are not the best they are pigmented but very sticky when I applied them to my lips. I could really tell tell that they were cheap glosses. On the good side the lip sticks are amazing. They pay off I got was unreal, as you can see from the swatch they are super pigmented. Super moisturizing on the lips. I love they both. Sorry guys I can't remember the name of them from the top of my head. I will be posting pictures of these babies on Instagram where I will have the names of them on there. I hope you understood this post. If you have tried any of these let me know what you think about them. I would love to hear from you.